I’ve seen a lot of design programs ostensibly marketed at kids, but none are as cool as Modio. Created by Hilmar Gunnarsson, an Icelandic entrepreneur, the system allows you to build Lego-like creatures that snap together and can be printed in multiple colors. Why is this so cool? Because each part sticks together like magic and you can change sizes, textures, and even colors on the fly. Then you can print in multiple colors on the same plate, print different colors at different times, or just print everything in one color. It’s really cool. Gunnarsson self-funded the entire project and aims to make money by offering downloadable content – monsters and pieces – and allowing users to share and sell their models. “We created Modio to be easy to use even for a five year old, but still powerful enough so that an adult can have a lot of fun with it. 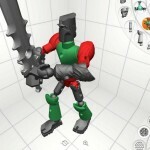 With Modio anybody can make amazing, fully pose-able models and then easily 3D print them,” he said. “The user interface is simple to use and designed for touch devices like the iPad – simply drag and drop the built-in parts to build. The parts snap together just like in reality and then you can play with your model in the app and pose the parts any way you want. The app supports multi-touch fully, so you can move multiple parts around simultaneously and more than one user can even create at the same time. The app can print things in multiple sizes and all of the pieces are flat on the bottom. The joints automatically resize and change when you add parts and the entire system measures the amount of filament that will be used and the speed of the print. In all, it’s a very unique toy-making system for kids and adults. I saw a number of prints created with the system and they are surprisingly cool, reminiscent of the Hero Factory line of Lego toys. However, because you can resize the models at will, you can make tiny insectoids or giant mech monsters. It’s really fun. In fact, the founder, who has three boys of his own, found out how addictive his app was when one of his son’s school friends came over to play. Instead of hopping on Minecraft, the friend became engrossed in Modio and played with it for hours. The next day he came back… to play with the app some more. Needless to say, Gunnarsson’s son was quite upset.